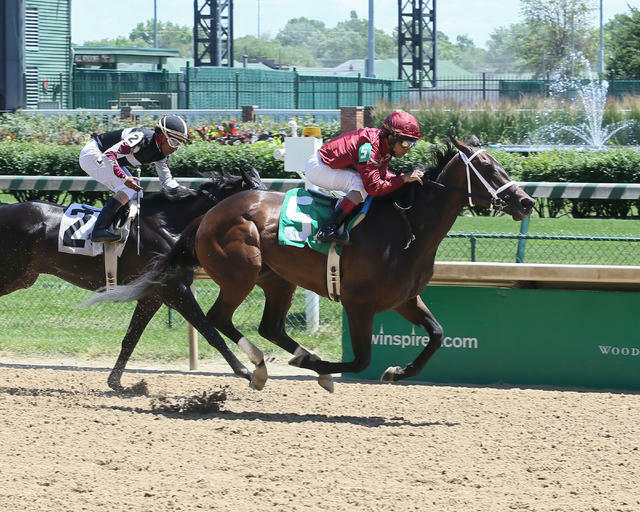 Qatar Racing, Hunter Valley Farm and Marc Detampel’s Indiana Oaks (Grade II) runner-up Figarella’s Queen has been made the slight 3-1 morning line favorite for Saturday’s 43rd running of the $100,000 Dogwood Stakes (Listed) at Churchill Downs as she heads a competitive field of 11 3-year-old fillies that were entered in the seven-furlong sprint. Trained by Brad Cox, Figarella’s Queen was victorious over the Churchill Downs dirt on June 3 in a second-level allowance race. The filly then finished 4 ¾ lengths behind Talk Veuve to Me on July 14 in the Indiana Oaks prior to pulling up in the far turn of the Aug. 18 Alabama (GI) at Saratoga. The likely pace setter in the Dogwood could be V-leaf Stables, Richard Ravin and Larry Rivelli’s speedy Jean Elizabeth. The Illinois-bred daughter of Adios Charlie is the 5-1 third-choice on the morning line and enters the race after scratching from Monday’s $400,000 Presque Isle Downs Masters (GII). Jean Elizabeth, a six-time winner, recently won a 6 ½-furlong state-bred allowance race by a comfortable 5 ¼ lengths over the Polytrack surface at Arlington Park. The field for the Dogwood, in order of post position (with jockey, trainer and morning line odds): Figarella’s Queen (Shaun Bridgmohan, Cox, 3-1); Divine Queen (Calvin Borel, Buff Bradley, 30-1); Shes Our Fastest (Jack Gilligan, Scott Gelner, 10-1); Jean Elizabeth (James Graham, Rivelli, 5-1); Miss Mimosa (Ricardo Santana Jr., Bill Mott, 8-1); Devine Mischief (Adam Beschizza, Joe Sharp, 4-1); Everyonelovesjimmy (Chris Landeros, Ian Wilkes, 6-1); Salt Bae (Julien Leparoux, Bernie Flint, 12-1); Primo Extremo (Walter De La Cruz, Jason DaCosta, 15-1); Naples Legacy (Gabriel Saez, Mike Maker, 30-1) and Go Google Yourself (Brian Hernandez Jr., Paul McGee, 5-1). The Dogwood is carded as Race 10 on Saturday’s 11-race program with a post time of 5:26 p.m. (all times Eastern). First post gets underway at 12:45 p.m. DOMINANT MAIDEN WINNER COVFEFE COULD TRY STAKES COMPANY IN NEXT START – LNJ Foxwoods’ impressive maiden winner Covfefe could try stakes company in her next start, according to trainer Brad Cox, after easily defeating eight rivals by 9 ¼ lengths Sunday in a six-furlong maiden special weight at Churchill Downs. Ridden by Shaun Bridgmohan, the 2-year-old filly stopped the clock in 1:10.20 and earned a Brisnet speed rating of 98. The 2-year-old filly is by Into Mischief out of the Unbridled mare Antics. WORK TAB – Churchill Downs Racing Club’s Warrior’s Club tabbed his final half-mile work Thursday morning in :49 prior to next Saturday’s $100,000 Ack Ack (Grade III) at Churchill Downs. The five-time winner has earned $703,104 for trainer D. Wayne Lukas. MEET LEADERS – Perennial leading rider Corey Lanerie began the week atop the jockey standings with five wins through the first three days of racing at Churchill Downs’ sixth annual September Meet. The 15-time local titlist had a one-win lead over Robby Albarado and Ricardo Santana Jr. … Tom Amoss topped the trainer standings with three victories from only five starters. Steve Asmussen, Brad Cox and Vicki Oliver were one win behind. … Calumet Farm, G. Watts Humphrey Jr. and Maggi Moss were in a three-way tie for leading owner with two wins each. DOWN THE STRETCH – Twilight Thursday’s eight-race program begins at 5 p.m. (all times Eastern) with a 20-cent Single 6 Jackpot carryover of $12,800 getting underway in Race 3 at 5:58 p.m. The night also features $1 beer, local food trucks and live music from the Sheryl Rouse Band on the Plaza Stage. Gates open at 4 p.m. … Multiple Grade I-winning sprinter Mind Your Biscuits is expected to log his final breeze Friday morning at Churchill Downs in preparation for next Saturday’s $200,000 Lukas Classic (GIII), according to trainer Chad Summers. The colt is scheduled to work at 5:30 a.m. … Bring the family to Sunday’s “Be Creative” Family Adventure Day presented by Kroger for an affordable day of fun and horseracing for the whole family. Churchill Downs’ partners will be on site to keep the kids entertained all day with a range of fascinating arts, crafts and science activities. Tickets start at $8 and can be purchased on www.churchilldowns.com. … Following recent discussions between Churchill Downs Incorporated and TVG, it was announced Thursday morning that Churchill Downs Racetrack’s races would air on TVG through the remainder of the September Meet, which concludes Sunday, Sept. 30.